Simplify UC&C management without losing functionality or visibility. eXsight works on all PBX systems from major switch vendors including Cisco, Avaya, Microsoft Skype for Business, Unify, Mitel, Alcatel-Lucent, Nortel, NEC and others. eXsight is a UC&C manager’s new best weapon in the ﬁght to keep all of their company’s communications, and internal and external collaboration, on track. MTS’s eXsight Call Accounting offers companies of all sizes and industries a flexible solution for capturing and managing those unified communication costs. eXsight is a robust, feature-rich call accounting system delivering complete visibility into telecom usage. eXsight allows the tracking and control of unified communication usage in and out of the organization automatically through a network connection to any corporate switch – traditional or IP-based. The data collected can instantly be reproduced in the form of statistical reports. IP-based switches and unified communication platforms. eXsight for Cisco Switches works in both homogeneous and heterogeneous network and switch environments and has passed Cisco compatibility testing. eXsight for Unify Switches works in both homogeneous and heterogeneous network and switch environments and is a feature-rich call accounting solution for Unify environments. The eXsight for Microsoft Skype for Business solution not only supports Microsoft Skype for Business but it also supports a hybrid. eXsight for Mitel works in both homogeneous and heterogeneous network and switch environments. 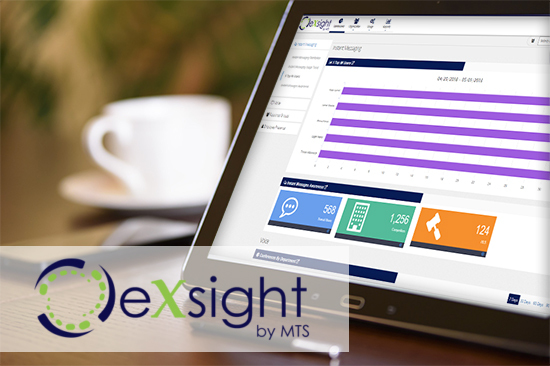 eXsight is a feature-rich call accounting for Mitel solutions that provides complete visibility into voice and other unified communication usage throughout the organization. eXsight for Avaya Switches works in both homogeneous and heterogeneous network and switch environments. eXsight for Avaya supports the collection and reporting of usage data. eXsight Cloud Call Accounting offers all the features of a traditional licensed Call Accounting solution plus all the benefits of a cloud deployment…No capital costs, no software and hardware.